It’s National Curry Week www.nationalcurryweek.co.uk until Sunday 28 October, so what better time to visit your local Indian restaurant? 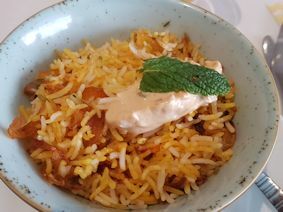 When you have food allergies, dining at an Indian restaurant can be problematic, especially if, like Ray, you can’t eat dairy. This is because Indian restaurants usually use ghee butter. 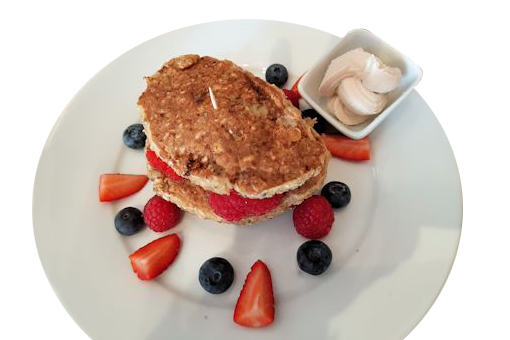 At Saffron Summer http://www.saffronsummer.co.uk/ in Surrey, the menu usefully carries symbols – (G) for items containing gluten and (N) for items containing nuts, with the usual (V) for vegetarian food. A vegan menu is also available. 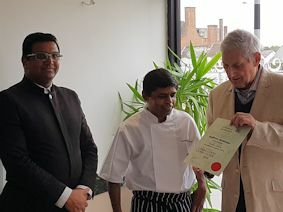 We were at the restaurant to celebrate the presentation of a Certificate of Excellence to chef Awanish Roy from Pat Chapman, who is the Cobra Good Curry Guide editor. The restaurant has also been shortlisted for a prestigious Asian Curry Award, of which Pat Chapman is chairman of judges. The winners will be revealed at a gala dinner on Sunday 18 November. Awanish Roy trained at Oberoi Hotels in India before moving to London to work at the Cinnamon Club. Pat Chapman is a well-known expert on Indian food. He has written 34 books including the first Balti cookbook which became a Sunday Times number one best seller. Pictured above from left to right is Nacita Diniz, manager; Awanish Roy and Pat Chapman. During the lunch, Nacito Diniz, manager, ensured that Ray and I enjoyed a range of Indian dishes that catered for our dietary requirements. I enjoyed the potato fritters (gluten free) while Ray sampled “bhelphri” – rice and vegetable snacks. 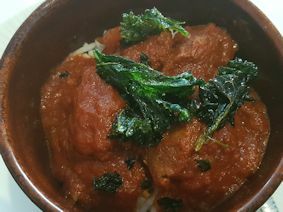 For our main course there was wild boar vindaloo curry (dairy free) with steamed rice for Ray and lamb biryani (gluten free) for me. Delicious and presented in attractive bowls. Above pictured from left to right wild boar vindaloo and lamb biryani. The restaurant has launched a Kebab, Biryani and Street Food Fest every Wednesday from 6pm to 10pm. 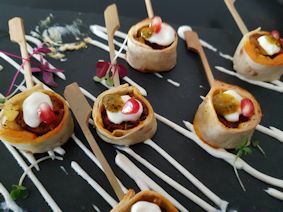 A whole range of kebabs are served which are prepared in one of five cooking styles – roasted on a tandoor or a sigri, shallow fried in a tawa or a mahi tawa or deep fried in a kadhai. We are already arranging a return visit with friends.